I’ve been so terribly busy in the last two weeks that I haven’t even taken the camera in my hands. But I’ve not given up on photography totally. For example, I’m watching the Radiant Vista videos that I collected during the past few months (while concentrating on reviewing my old images and having no time for anything else). 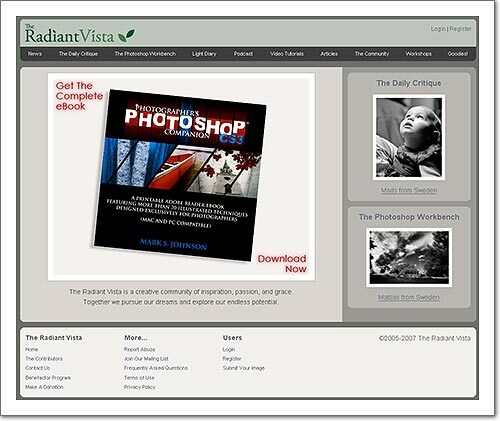 I was very excited when I first discovered Radiant Vista and I started visiting the web page at least once a week in order to download the image critiques, Photoshop workbenches and video tutorials. Even with the authors sometimes going on a bit too long about spirituality and creative vibes and the advertisements for their own books and workshops having become more aggressive in recent weeks, I still find the content quite interesting and worth my time.